Proper lubrication procedures are the key to a good all-around maintenance program. If the oil is not doing its job, or if the oil level is ignored, all the maintenance procedures in the world are not going to keep the transmission running or assure long transmission life. Eaton Fuller transmissions are designed so that the internal parts operate in a bath of oil circulated by the motion of gears and shafts. 4. Buy from a reputable dealer. Change the oil filter when fluid or lubricant is changed. (especially a coating on seal areas causing oil leakage), change to Eaton Roadranger CD5O transmission fluid, heavy duty engine oil or mineral gear oil to assure maximum component life and to maintain your warranty with Eaton. Additives and friction modifiers are not recommended for use in Eaton Fuller transmissions. Make sure oil is level with filler opening. Because you can reach oil with your finger does not mean oil is at the proper level. One inch of oil level is about one gallon of oil. Drain transmission while oil is warm. To drain oil remove the drain plug at the bottom of the case. Clean the drain plug before reinstalling. Clean case around filler plug and remove the plug from side of the case. Fill transmission to the level of the filler opening. If the transmission has two filler openings, fill to level of both openings. The exact amount of oil will depend on the transmission inclination and model. Do not overfill; this will cause oil to be forced out of the transmission. When adding oil, types and brands of oil should not be mixed because of possible incompatibility. The transmission should not be operated consistently at temperatures above 250ºF (120ºC). However, intermittent operating temperatures to 300ºF (149ºC) will not harm the transmission. Operating temperatures above 250ºF increase the lubricant’s rate of oxidation and shorten its effective life. When the average operating temperature is above 250ºF, the transmission may require more frequent oil changes or external cooling. The following conditions in any combination can cause operating temperatures of over 250ºF: (1) operating consistently at slow speeds, (2) high ambient temperatures, (3) restricted air flow around transmission, (4) exhaust system too close to transmission, (5) high horsepower, overdrive operation. External oil coolers are available to reduce operating temperatures when the above conditions are encountered. – With engines 399 H.P. and above with overdrive transmissions and GCWs over 90,000 lbs. Mild EP gear oil and multipurpose gear oil are not recommended when lubricant operating temperatures are above 230ºF (110ºC). In addition, transmission oil coolers are not recommended with these gear oils since the oil cooler materials may be attacked by these gear oils. The lower temperature limit and oil cooler restriction with these gear oils generally limit their success to milder applications. 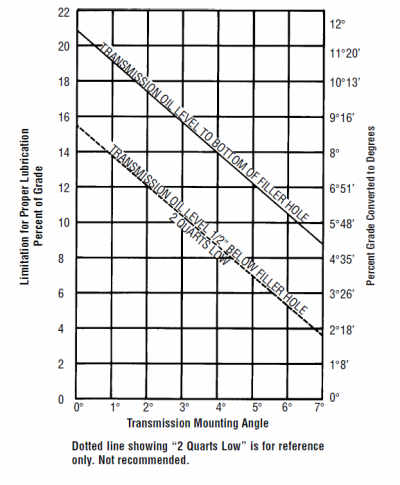 If the transmission operating angle is more than 12 degrees, improper lubrication can occur. The operating angle is the transmission mounting angle in the chassis plus the percent of upgrade (expressed in degrees). 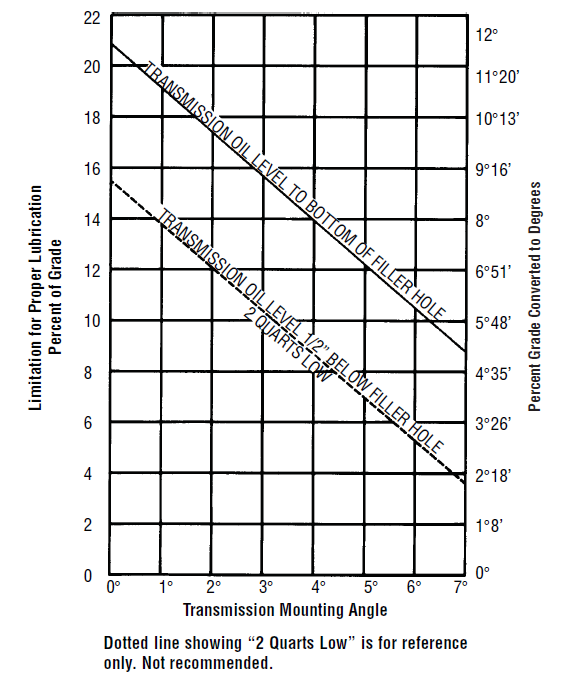 The chart illustrates the safe percent of an upgrade on which the transmission can be used with various chassis mounting angles. For example: if you have a 4-degree transmission mounting angle, then 8 degrees (or 14 percent of grade) is equal to the limit of 12 degrees. If you have a 0-degree mounting angle, the transmission can be operated on a 12 degree (21 percent) grade. 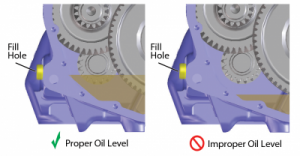 Anytime the transmission operating angle of 12 degrees is exceeded for an extended period of time the transmission should be equipped with an oil pump or cooler kit to ensure proper lubrication. Note on the chart the effect low oil levels can have on safe operating angles. Allowing the oil level to fall 1/2″ below the filler plug hole reduces the degree of grade by approximately 3 degrees (5.5 percent). Proper Lubrication Levels are Essential!